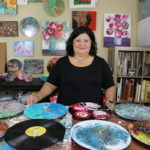 Welcome to the studio of local artist Carolyn McGowan, an alternate galaxy of glossy discs of all sizes, swirling with color. 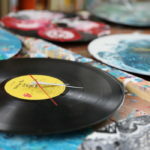 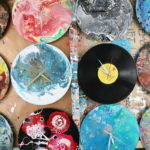 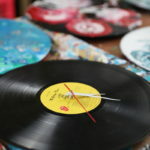 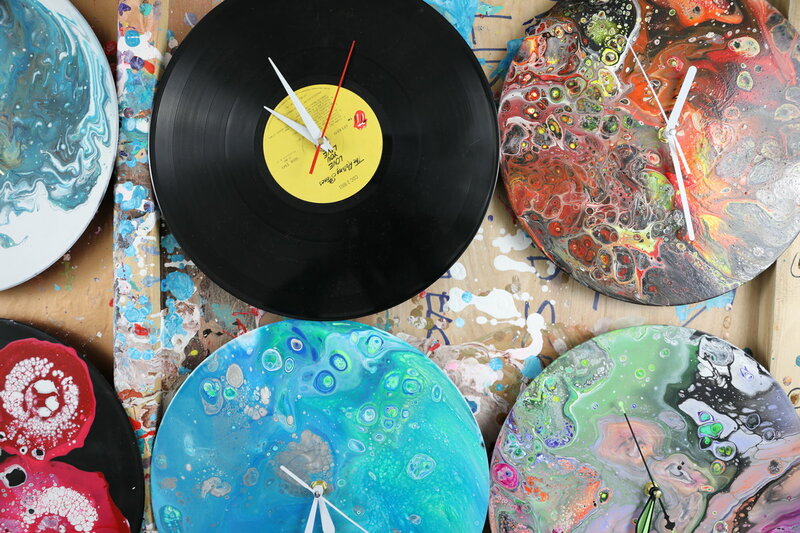 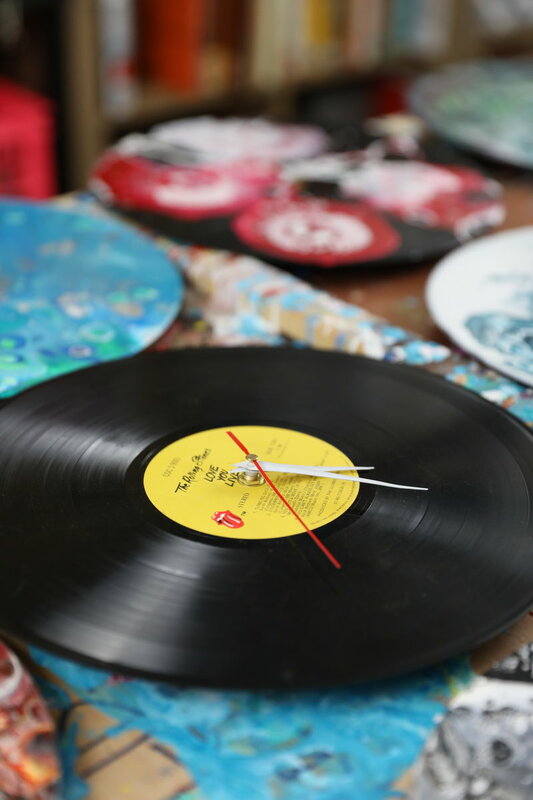 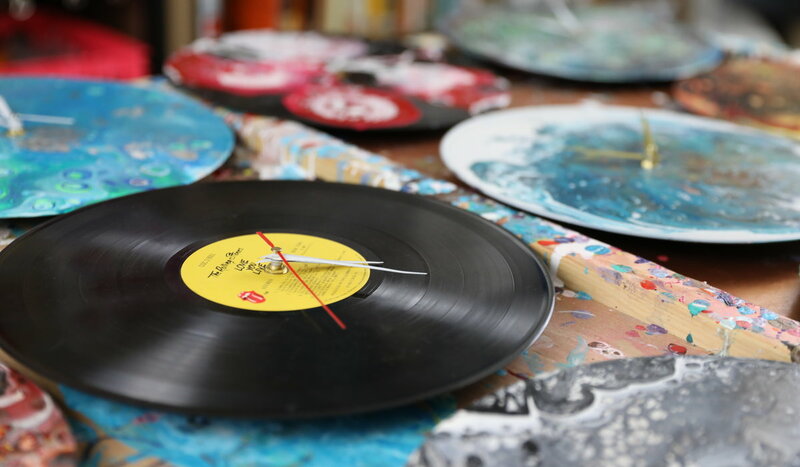 Hiding underneath the twists and cells of paint lie unlikely canvases—old-school record albums, compact discs and wood tabletops, given a second chance as unique works of art. 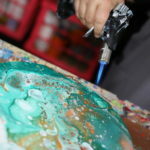 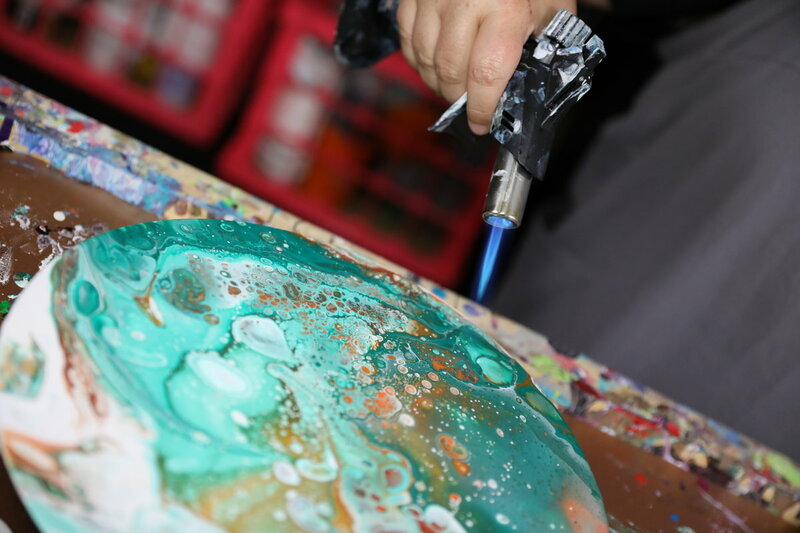 Using a technique called paint pouring, McGowan brings new life to discarded objects. 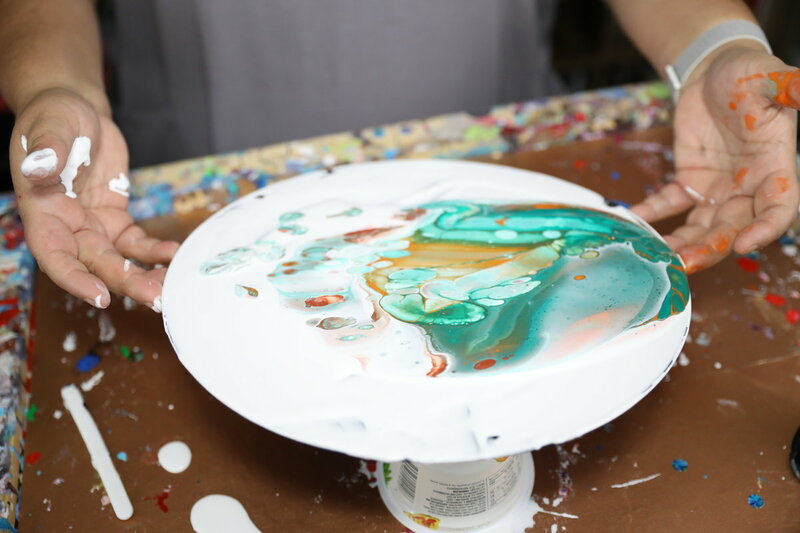 “I fell in love with acrylic pouring because it’s so unusual,” Carolyn says. 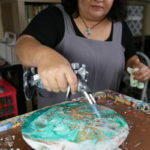 Carolyn’s workshop is an eco-haven. 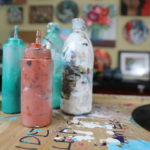 Centered around a work table crafted from a wooden shipping crate, the vibrant space is a showcase of her works. 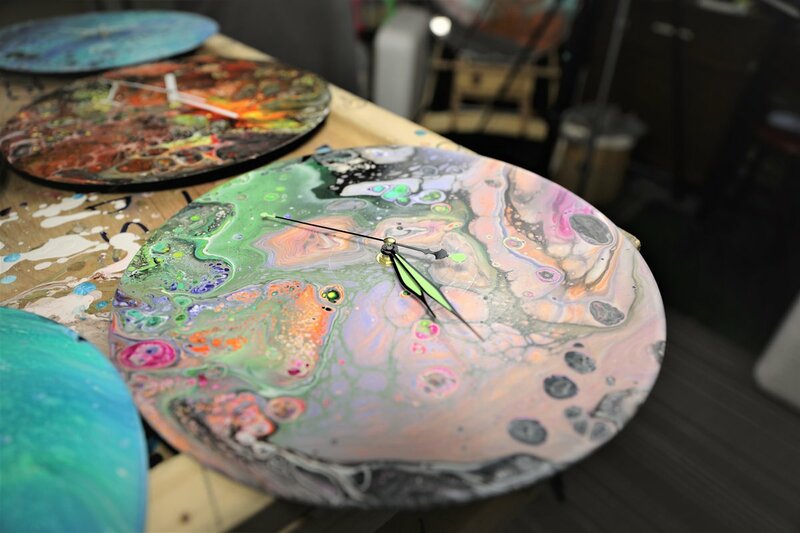 In one corner, a glass tabletop dries, awaiting a unique base so it can be recycled into custom furniture. 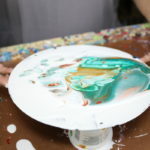 She pulls from a stash of saved yogurt cups in which she prepares paints. 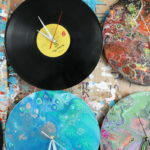 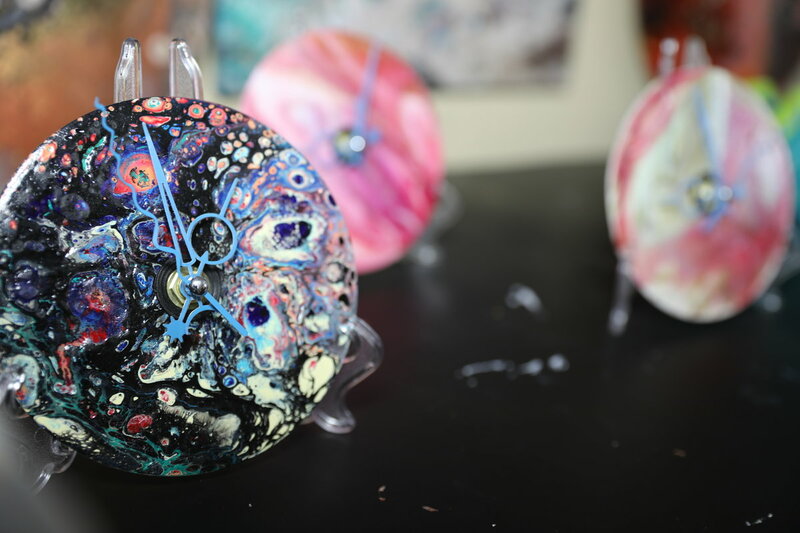 Carolyn even reuses her leftovers, fashioning acrylic skins and drippings into one-of-a-kind coasters, trivets, clocks and wearable art: necklaces, earrings and shoes. 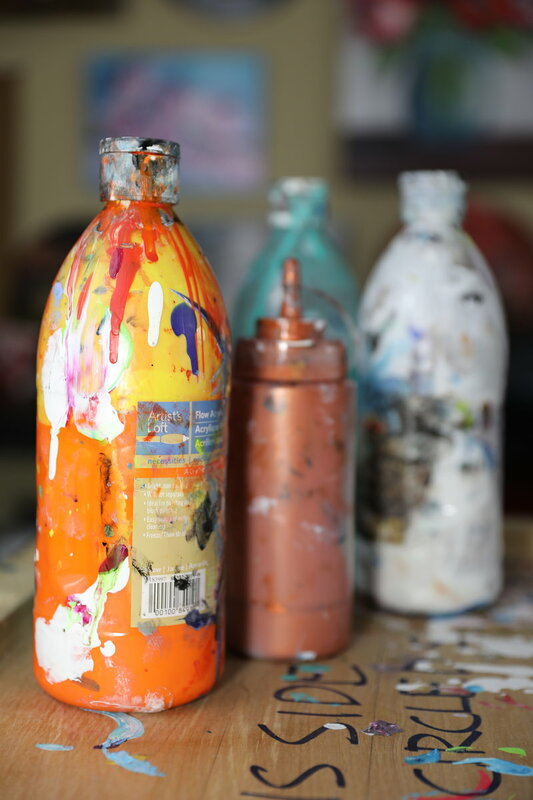 “Some of my art is functional—it has a usefulness. 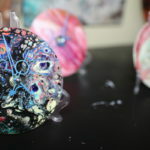 I do both functional art and art for the pure pleasure of making it,” she explains. 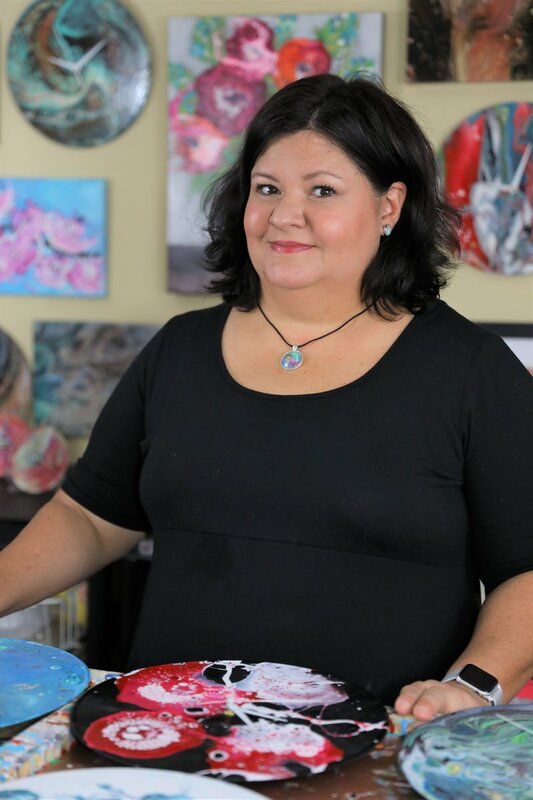 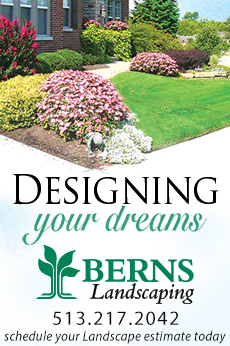 Carolyn grew up in Liberty Township, surrounded by a loving family. 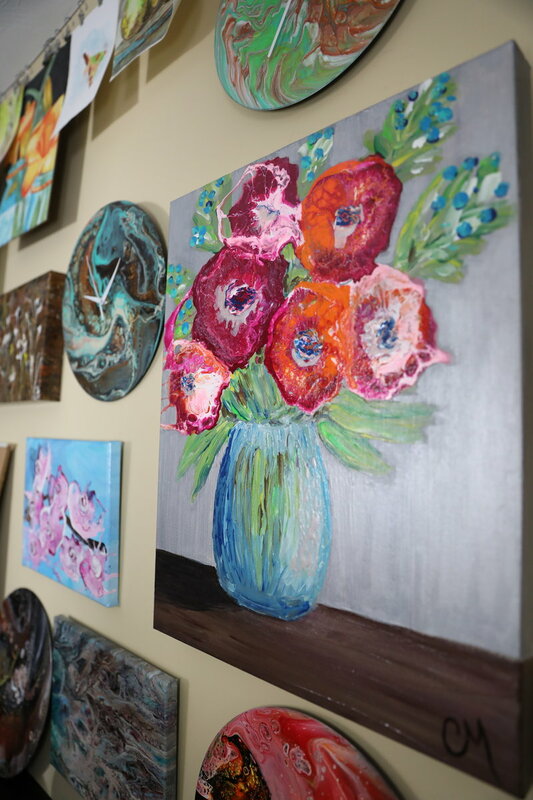 At a young age, she enjoyed school art classes. 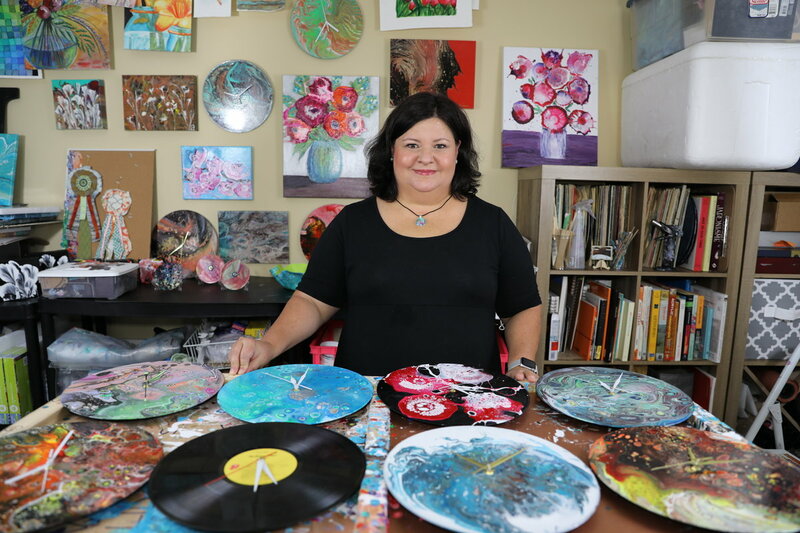 Her breakthrough as an artist came recently, when her adoptive parents encouraged her to meet her birth mother. 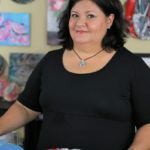 As she unearthed her biological roots, she found shared interests in art, photography and travel. 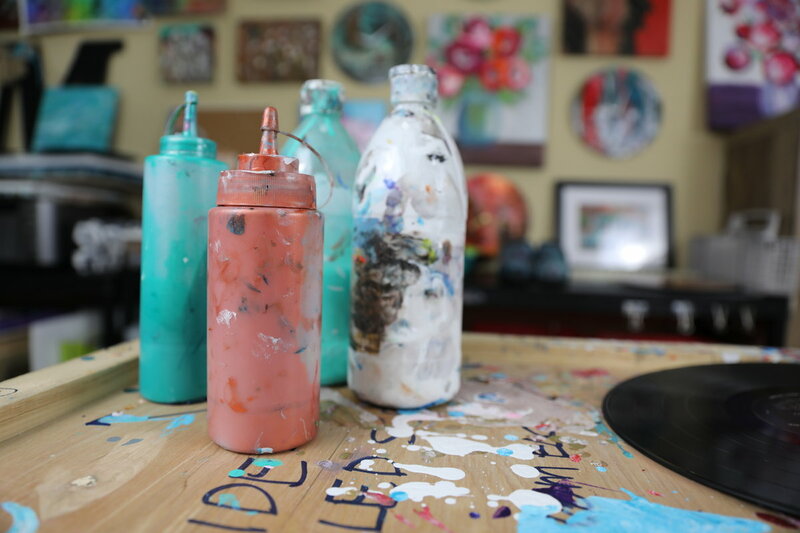 The stars aligned, guiding this gifted artist through a personal journey of self-discovery that drove her back to her first love—art. 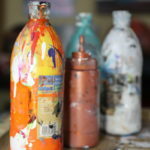 Inspired by the ocean and international adventures, Carolyn leans toward bright pinks and earthy blue and brown hues with splashes of metallics. 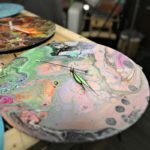 In her studio, science meets art and function collides with fashion, bringing color to our world. 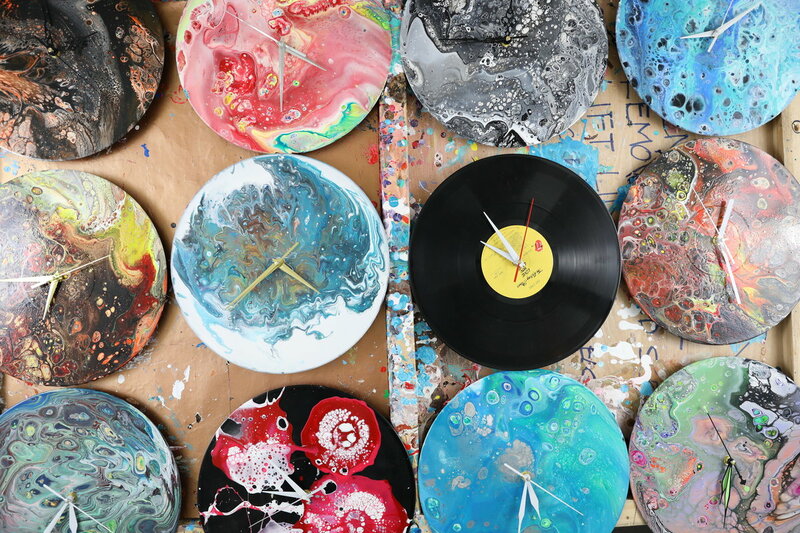 “I love it and think anyone can do it. 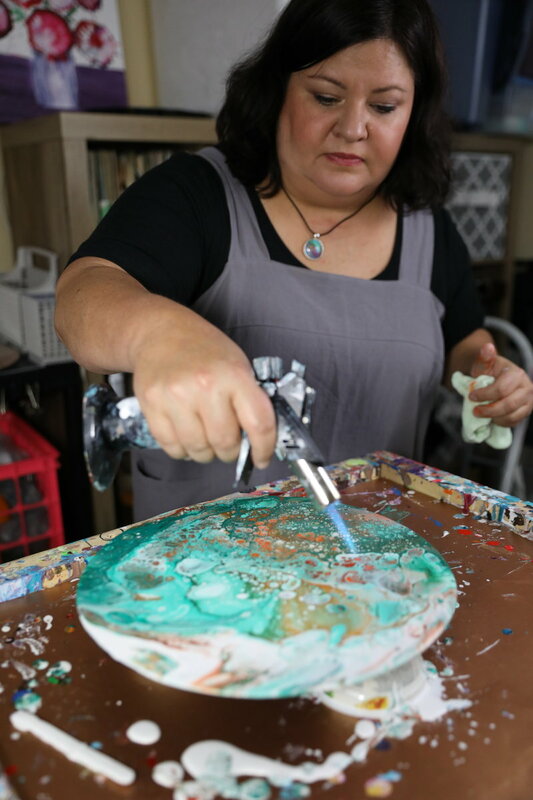 The more people who do art in this world, the better,” she says. 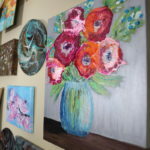 See Carolyn’s gallery and spring schedule online at Facebook and Instagram: @ArtByCMStudios and at ArtByCMStudios.com.